Tedder Industries (Coeur d’Alene, Idaho) was founded in 2010 by Thomas Tedder to manufacture firearm accessories, such as gun belts and concealed-carry gun holsters. The company operates from a 70,000-square-foot vacated outlet mall and sells its three primary lines of firearm accessories online. From their online-only sales and disaggregated, lean management structure to their product quality tests that involve hitting prototypes with a hammer, Tedder Industries has built a unique and ingenious reputation. Since its founding, the company’s three products—Bigfoot Gun Belts, Old Faithful Holsters and, their most popular line, Alien Gear Holsters—have been a huge success. The holster designs reflect Tedder’s efficiency mentality, and the company’s engineers are all personal fans of the products they make. They have been designing up to 40 tools a year. 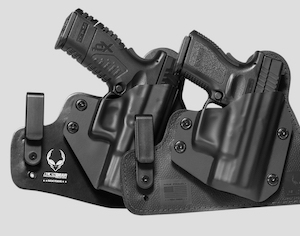 Their latest Alien Gear holster, named Shape Shift, has 30 pending patents and 11 different configurations, all of which can be switched out quickly and easily. Everything is interchangeable, allowing for fast, easy adjustments to ensure both comfort and practicality for customers. At NPE in 2015, Tedder visited numerous booths looking for an injection molding machine that would be able to match the company philosophy and help it continue to push products forward. Tedder had decided to move all molding operations in-house to better manage quality control and keep all manufacturing under one roof. That meant finding the right molding equipment to do the job. Tedder immediately gravitated toward Wittmann Battenfeld because of its range of integrated products and one-stop shop and single-source capability. After traveling to various West Coast regional facilities to look at the machines in action and talk with the support staff of various molding machine suppliers, Tedder was certain that Wittmann Battenfeld was the best choice for his company. Tedder now has five Wittmann Battenfeld injection molding machines: Two EcoPower 240/1330 electric injection molding machines and three EcoPower 110/130 systems. The company has three more on order to be delivered this year. These injection molding machines are complemented by two Drymax dryers, five Tempro Direct C250 Primus temperature control units, five Feedmax feeders, three Coolmax coolers, two Dosimax blenders, two hoppers, a Tempro Direct basic TCU, a loader, a material dryer and a granulator.